If you have set foot into the medical world, then you have probably been impacted by the work of a nurse. All across the country, nurses are the caretakers, advocates, teachers, and friends who make caring happen. Come along with us as we open the doors to the world of nursing. What does it take to be a nurse? What kind of impact do nurses have on their patients? Why is nursing such a meaningful career? It’s time to hear the stories of how nurses change lives. A career in the Progressive Care unit demands a lot from its nurses. With a high level of activity and a higher patient-to-nurse ratio than other floors, nurses are asked to take on many responsibilities and provide all different levels of care. As a recent graduate of nursing school, this demanding world may seem like a large obstacle for Joe S., Professional Staff Nurse at UPMC Mercy. But this career is one that Joe has been preparing for his entire life. When Joe was just fourteen years old, he started his first job in the health care field. Working as a care aide in an assisted living facility, Joe’s duties were limited to bringing water to the residents, passing out food trays, and making beds. His work as a care aide only lasted for a few years before he left the field and began pursuing other opportunities. What Joe didn’t know at the time, however, was that his first job would launch a lifelong love of helping people and a decades-long career in health care. Nursing was always what I actually wanted to do, deep down. When Joe was in his early thirties, his mother suddenly and tragically passed away. Ten years into his career, he decided to make a change. 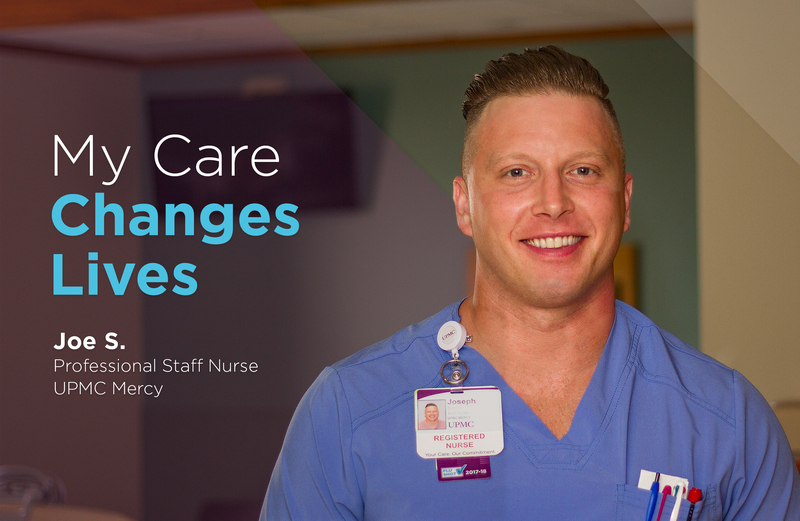 Knowing that nursing was the career that his mother wanted for him, Joe was motivated to pursue the dream that he had always had. After many years of waiting, Joe made the jump into nursing school. Are you ready to discover what a nursing career at UPMC could mean to you?